Magnificent Sea views, Central, 2 double bedrooms, 2 bathroom. Pets welcome. 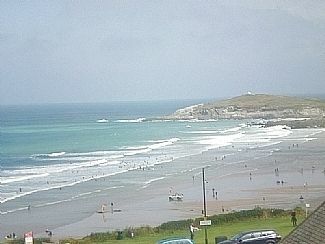 Apartment in Newquay, Cornwall, England - 100m From Fistral Beach, 15 Min Walk To Central Newquay. Pets welcome at small extra charge. One of the best beach views in Newquay. Don't believe it, look ate the reviews. This modern luxury apartment which has some uninterrupted views to Fistral Beach, Newquay Golf Course and the Headlands Hotel will keep you enthralled for hours. A large balcony off the lounge is great for those evening drinks or lazy lunches. It is in excellent location being just 150m to the steps to one of the best surfing beach in the UK. The busy lively Newquay centre, with its great surfing atmosphere, clubs, bars and shops is only a 15 minute walk away. The great coastal walk passes right in front of the apartment. Newquay Golf Course is just across the road. From the lounge and balcony you will be able to watch the golfers as well as the surfers. Please note the site adds almost 10% service charge if you wish to pay by debit or credit card, whilst this option may give extra protection. Should you be happy to pay us the owners direct this extra cost is not payable. We welcome pets but a fee of £10 per day is required. Best views on the site. Close enough to the centre to walk but far enough away for peace and quiet. You can see all the action on Fristral beach of sea. If one of the party surfs you will be able to watch them from the balcony. We even provide free telescope. En-suite to master bedroom with large shower. Main full bathroom with full bath with shower over. Under floor heating. Very comfortable but can take a sometime to get to desired temperature. Allocated private parking bay, within a gated secure car park. There are 4 visitors parking bays, limited to 24 hours parking. Under floor heating and laminate floors throughout. Corner sofa with small double sofa bed. LCD TV, CD radio. BT broad band hub available for internet connections. Fully equipped kitchen, built in full cooker, microwave, hob, extractor, washer/dryer, dishwasher, large fridge/freezer. Extendable table with six leather chairs. With magnificent views to beach. Patio table and chairs. Newquay Golf Course is adjacent to the apartment, the club house is a short stroll away. There are numerous great courses within a 30 minute drive. Sorry it is on the 2nd floor, with no lift access. The apartment is not suitable for guests with mobility issues. Notes on accommodation: Apartment has under floor central heating. Note - Well behaved house trained pets welcome, additional cost of £10 per day, damage deposit of £50 may be requested. Rates stated includes up to 4 guests. Apartment entry is by a key safe. The code for the key safe plus info re apartment will be sent approx 7 days prior to the holiday date. Outside: One private parking space is allocated, this is accessed via electronic security gates. Cleaning / Towels / Linen / Maid service: Linen and towels will be changed weekly, unless otherwise requested. Extra cleans can be arranged and at extra cost, please advise at time of booking. Mid week cleans can also be arranged. Book in is from 3pm. Exit before 11am. Other: Large balcony off the lounge with patio table and chairs. Super stay in a lovely location. Third time staying here, can never tire of that view and the wonderful apartment. Thankyou very much for taking the time to review and describe your positive experience. Really glad you feel the same us about the apartment and its great location & views. The views do change throughout the year, great for storm watching in the Winter and lazing on the beach in the Summer. The mad surfers, well they are there all year round! Thanks again Sue & Clive. This dog friendly apartment with classy decor & stunning views is a perfect sanctuary for a relaxing break . Very comfortable & equipped with everything you need . Easy access to Fistral Beach & Newquay town Center, it was lovely to wake up everyday to the sound of the sea , and looking forward to staying here again. Thanks for the feedback, really glad you enjoyed your stay, it was great weather for storm watching, but not so good for beach combing. We arrived to a friendly welcome from the owners. The apartment had everything we needed for our stay and a lot of thought had been put into the decor and layout of this lovely apartment. The en suite bedroom with shower and toilet was a real plus for my mother as she is unable to get in a bath. Our days were spent bodyboarding, walking along the coastal paths with our dog and there was never a dull moment looking over Fistral beach from the balcony or living room, whatever the weather. We would recommend the Fern Pit Cafe at top of road near the Gannel Estuary, dog friendly, great views and fantastic crab salads. We walked from the cafe down their steps to Crantock beach over the footbridge at low tide and virtually had the beach to ourselves. A wonderful holiday, we will be back. Thank you. Would recommend to anyone, lovely apartment, great views and location. Thoroughly enjoyed our stay. The apartment has great views is well equipped and spacious. So glad you enjoyed your stay with the lovely views and the great location. British surf championships are held at Newquay, dependent upon surf conditions, often on Fistral Beach. Great location for walking holidays being a few minutes walk from the coastal path. Fistral Beach is 150 metre walk. Bar/cafe 10 minute walk across the beach. The Cornwall coastal walk passes in front of the apartment. Newquay train station 1.5 miles. Bus station 15 minute walk. Train station - Bodmin 15 miles. A30 duel carriageway 6 miles from apartment. The internal pictures represent the standard of furnishings. The views are taken from the actual apartment. Booking Notes: 25% deposit required with booking, balance required six weeks prior to holiday. Payment can be made either by cheque to home address or by paying direct into bank account. Approx 7 days prior to holiday, full details will be sent including code for key safe. Sorry weekend or mid week breaks not available during peak weeks of school holidays or May bank holidays. Note pets are welcome at £55 per week + £50 refundable deposit. Extra guests 5 & 6 at £65 per week. Changeover Day: Flexible, dependent upon availability. Check-in time is not before 3.00pm and check-out time is 10.00am unless previously arranged with the owners. Notes on prices: Cost includes up to 4 guests, extra guests at £45 per week. Pets are welcome at £45 per week, plus a £50 refundable deposit is required to cover any damage or extra cleaning should it be required. Bookings may be required to pay a £50.00 refundable deposit for damage / breakages etc. Refundable deposit is not included in the weekly rates.